My 195-cm Olin Super Radius Ks are the quintessential rock skis.Well-coated in magnesium chloride from their time in the roof-rack on my Pontiac Grand Am, the skis have solid Salomon bindings that don’t let go of a ski boot. The Super Radius Ks are part of the Breakthrough Series (ha), according to a logo near the binding. By 21st-century standards, they’re also incredibly long and skinny. One ski has a nasty gash on its upper section, giving it just the right kind of grit for rock-ski status. The other ski still has, somewhat remarkably, the sticker on it from when it was purchased at a ski swap in Vail six years ago. 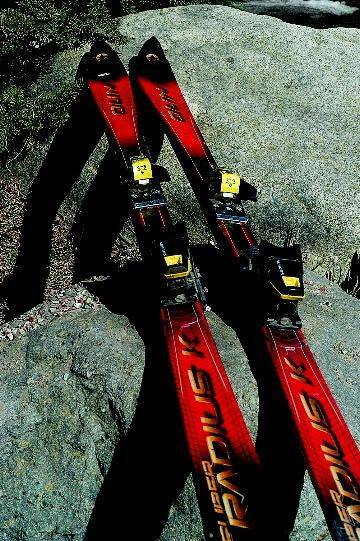 These skis are troopers. These skis have allowed me to see and ski vistas of stunning beauty, and for that they must be respected. Well, not really. They are, after all, just a crappy pair of skis. It’s very possible that they are the worst pair in town.They haven’t been tuned or waxed in years, because what’s the point? The skier on them won’t be able to tell the difference and usually has no time or money for a trip to a ski shop to improve a deplorable pair of skis.